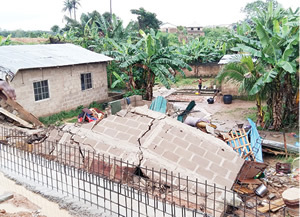 The fence being constructed by a university owned by the Mountain of Fire and Miracles Ministries ─ Mountain Top University ─ in Ilu Oba, Magboro, in the Obafemi Owode Local Government Area of Ogun State collapsed on Thursday, killing a four-year-old girl. The deceased, Olamide Adegbesan, was said to have slept on a couch with two of her siblings in their parents’ house when tragedy struck. The university, which secured its licence early this year, had started work on its permanent site, trying to replace its temporary fence with a permanent one. house shortly after, trapping the deceased, her mother, a six-month-old child and two other children. Speaking with Punch, the deceased’s mother, Mrs. Ayobami Adegbesan, who had not been informed of the death of Olamide as of the time of the interview, explained that she managed to escape from the rubble of the building, which had been levelled by the fence. She added that she managed to rescue her six-month-old child, while neighbours rescued other children. PUNCH Metro, however, gathered that Olamide was brought out from the rubble alive, but died shortly after. “The fence had collapsed sometime in June but the engineer reconstructed it and made it a bit higher. It was raining heavily this morning (Thursday) and my husband had left for work around 5am. Later, I heard a loud sound and I felt everything falling on me. “At first, I thought I was dreaming. I managed to crawl out of the rubble with my baby. I was practically nak*d with the baby in my arm. I started crying for help, but people did not hear me because of the rain. I began knocking on doors until a few men came out to help me. An eyewitness, who joined in the rescue operation, identified simply as Ademola, said that the four-year-old did not make it to the hospital, as she died a few minutes after she was brought out of the rubble. He said the university’s entrance was a few metres away from the Adegbesan’s house, adding that the drainage channel being constructed around the fence could not hold the flood, which brought the fence down on the family’s house. The authorities of the institution could not be reached for comment as of press time, Punch reports.